...The Jack Abramoff bribery and corruption case might be one of the biggest Washington-related scandals to have occurred in my lifetime to this point. The others that stick out are the Iran-Contra affair and Bill Clinton’s impeachment. The impeachment will probably be the most talked about occurrence among the public at large because the American populace will no doubt find titillating stories of blow jobs and cigar dildos more entertaining than guns or money. 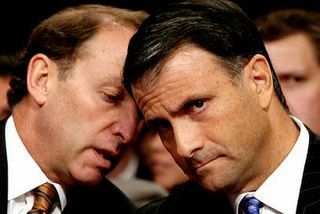 ...Even so, Abramoff defrauded clients and conspired to bribe public officials. In a plea deal, he’s decided to talk to federal investigators, which has sent shockwaves around Congress. Rumors are running rampant as to how many Congressmen will be implicated in the mess: Twelve? Twenty? One hundred? USA Today reports that Abramoff’s money trail leads to more than 240 members of Congress and committees over the span of six years. ...Since Abramoff is a Republican lobbyist, and since two of the most well-known names that have been associated with him are Speaker of the House Dennis Hastert and Representative Robert Ney, all the recipients must be Republicans, right? Well, that’s what Representative Louise Slaughter of New York wants us to think. ...Evidently Representative Slaughter didn’t get a chance to see the Abramoff list. ...In addition to many Republicans, many Democrats benefited from Abramoff’s shady dealings. Senate minority leader Harry Reid received $30,500; Representative Patrick Kennedy received $42,500; Representative Charlie Rangel received $36,000. Seven other Democrats are listed as being the top recipients for their party (the USA Today list is for the top-10 of both major parties). ...If we were to give any credence to Slaughter’s remarks, we would have to assume that only one party—the Republicans—would have its members listed as recipients. Then again, perhaps her memory is slipping; she’s apparently forgotten the 1996 case of fellow Democrat Dan Rostenkowski, who was sentenced to 17 months in prison for mail fraud, and the 2002 case of Democrat James Traficant, who was sentenced to eight years for bribery, racketeering, and tax evasion. Both incidents occurred while Slaughter was a representative in Washington. Maybe it’s just my opinion, but both of those cases degraded our democratic institutions and our core principles (if we actually have any). ...It’s obvious that the Republicans in Washington have their hands full as this is another major black mark against them. It’s also a major black mark against the Democrats on the other side of the aisle, since they had their hands in the Abramoff cookie jar as well. The difference in the case is that one party isn’t commenting about their involvement, while the other party is simply in denial and pretending that they had no involvement. ...It looks as if 2006 will be yet another year to vote third party. ...Apparently the “deny, deny, deny” approach is the standard operating procedure for this. When CNN’s Wolf Blitzer asked Democratic National Committee Chairman Howard Dean if Democrats who took money that was related to Abramoff should return it, Dean said that they never took it in the first place. ...What’s going to be denied next? The Holocaust? The popularity of Jerry Lewis in France? George W. Bush losing the popular vote in 2000?